A shift by mass retailers to a more just-in-time inventory strategy transfers both cost and risk to the supplier base, particularly small and mid-sized suppliers. This was among the findings of a survey of 110 logistics executives at consumer packaged goods companies, conducted by Auburn University and sponsored by KANE. 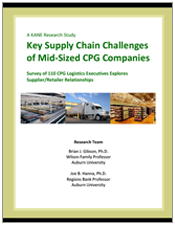 This paper outlines the supply chain challenges and frustrations faced by small and mid-sized CPG companies, as told to Auburn researchers.